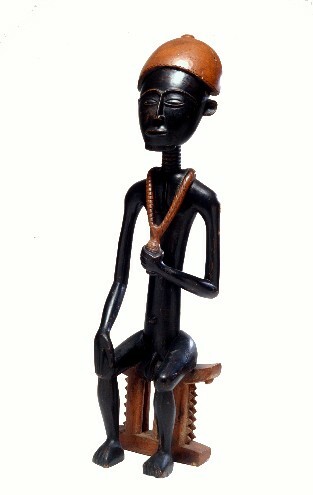 43" x 12" x 8.5"
The Akan culture is made up of many peoples (the Asante, Baule and others) of Ghana and Côte d'Ivoire. "Akan" describes a linguistically connected group. This figure is broadly identified as being from the Akan culture because it is not known which particular people created it. It may be a spirit wife or husband. The Baule people say that before you were born, you were married in the spirit world. When you are born, the spirit spouse follows you into mortal life. The spirit spouse helps you throughout life in personal achievement, interpersonal relationships and in matters of wealth. However, a spirit spouse may also bring about difficulty. In this case a diviner would instruct you to have a new spirit spouse created. Then you must build a shrine in your sleeping room to appease your original spirit spouse. The spirit spouse must be kept well-fed, clean and protected with a covering of white cloth. Bibliography: Vogel, 1997, pp. 30, 240, 246-247.